Sunchoke Soup, Thyme for Cooking winter gourmet first course. This is based on a recipe in '500 Soups'. It was so simple I couldn't resist. Peel the sunchokes, cut into chunks and immediately put into chicken stock. They discolor fast. Cover, bring to a boil and simmer until tender, about 15 minutes. 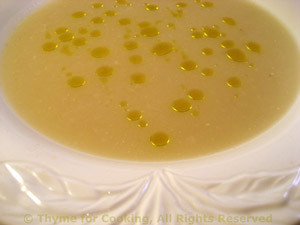 Ladle into soup plates, garnish with truffle oil or olive oil and serve.